We are providing a huge variety of TVS Tungsten Vial Shield to our prestigious customers. The name of the offered vial shield itself indicated that, it is manufactured by using supreme range of pure tungsten metal. This type of TVS vial can be loaded either from the top or bottom of the shield. 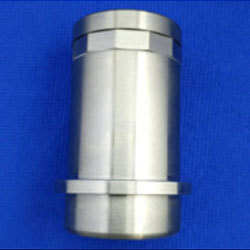 Our TVS Tungsten Vial Shield also has a loss proof injection port, which enable an easy access to the septum of the vial. The external and internal dimensions of the Tungsten shield are 70 mm and 56.5 mm respectively.